I had the incredible opportunity of collaborating with great friend, Dj-Producer Jorge Ojeda on the Remix of “The Girl Inside The Magazine” by London Exchange. Reviews on the incredible Album are coming fast and with great feedback. 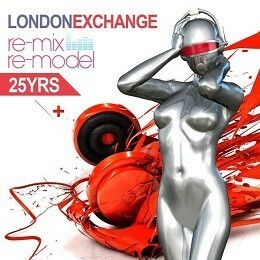 London Exchange have released the album “Re-Mix/Re-Model 25YRS” to celebrate 25 years of London Exchange who are based in Miami, USA. The haunting “Hide From The rain” with it’s orchestrated sounds and weather sound effects is the opening track on the album followed by the powerful sounding forthcoming single “Love In The First Degree” which in parts has a bit of a Pet Shop Boys influence. The uptempo synth laden “Makes Your Heart Beat” is very refreshing, again a touch of Pet Shop Boys about this, especially their song “Domino Dancing”. The stripped down version of the Prince track “When Doves Cry” is well executed and an excellent cover version. “Always On My Mind is pure 80s synth pop, acoustic guitar based “Angels In My Head” is a pleasant surprise. The sequencer driven instrumental track “Novisibirsk” is also a great track. The next selection of tracks feature there more well known songs, “Time Will Tell” is a storming synth dance track, one of their best ever tracks. The dance pace continues with the extended mix of “Forever”, which has a fantastic synth riff, with the ever popular “We Are Not Together” next. A WLR favourite is “Fall Apart” which we get in extended format on this album. The last section of the album features remixes of some of their finest cuts, George Acosta’s Remix of “Memories Of You” is perfectly suited to nightclub dancefloors, “Lost Without Your Touch” is probably the one remix that didn’t grab me. Jorge Ojeda & Luis Beyra’s re-work of “The Girl Inside The Magazine” is impressive, they have created a more house/techno version of one of their biggest songs. The Azzimov Remix of “Time Will tell” is definitely geared to the more modern club scene. Listening to this album as a complete body or work is a very enjoyable listen, it is certainly varied which shows the band have been brave enough to adapt to the sounds around at the time the tracks were recorded, we get electronic pop, acoustic, minimal, techno & house all in one collection.